gives the frequency of word in typical published English text. gives an association of frequencies of the wordi. gives a time series for the frequency of word in typical published English text. gives a time series for dates specified by datespec. gives property prop of the word frequency. WordFrequencyData[word1|word2|…] gives the total frequencies of all the wordi. WordFrequencyData[word,"Total",datespec] gives the total frequency of word for the dates specified by datespec. 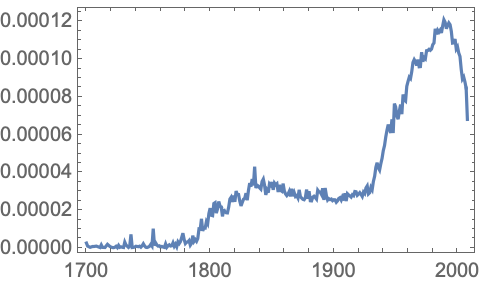 By default, WordFrequencyData uses the Google Books English n-gram public dataset.